Mahāvīra (ca. 599-527 B.C.) - Jainism is a prehistoric religion from India which is still adhered to by millions of people today, making it possibly the oldest religion still in practice. 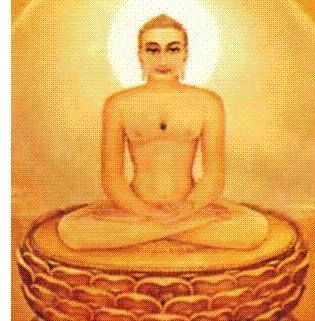 Mahāvīra, therefore, is not the founder of Jainism, but rather is considered the 24th and final tirhankara, which is roughly equivalent to a prophet. Jainism teaches that every living thing has an eternal and living soul which is responsible for its own actions. As a result, individuals are expected to respect and honor the spiritual nature of every living being. This makes Jainism the world's first religion to practice non-violence (ahimsa) as a way of life. There are many similarities between Jainism and Buddhism and the earliest Buddhist texts mention Jainism as a competing faith. Mahāvīra is thought to have been an older contemporary of Siddhārtha Gautama (Buddha), and although they came from the same area, there is no evidence that they ever met. He was the son of King Siddhārtha (not to be confused with Buddha) and Queen Trisala and raised as a royal prince. Ironically, the name Mahāvīra is Sanskrit for "great warrior" indicating that he probably came from a warrior caste. His place of birth was Kundagrama, whose location is not exactly known, but is somewhere in the modern state of Bihar. At the age of thirty, after his parents' deaths, he renounced his princely status (he was not the oldest son so this did not upset succession), gave up his worldly goods, and focused on meditation and attaining the Jain ideals. The exact year of his death is not known, but is commonly accepted as 527 B.C.. Much of what is gleaned about his life comes from the Kalpasutra, which was written by a Jain named Bhadrabahu sometime in the 2nd century A.D.. Because of the similarities between Mahāvīra and Buddha and the lack of contemporary sources on their lives, there has been speculation that they may have been one and the same.